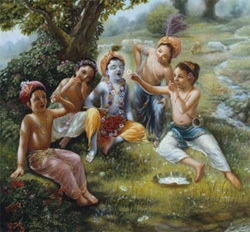 Krishna knows how to have a good time better than anyone. So why does He come to Earth—a known hangout for people who either don’t like Him or have serious problems accepting His very existence? As the Supreme Social Being, He’s not happy that any of His infinite parts and parcels would prefer to alienate themselves from His company. He doesn’t force Himself on anyone, but He’s more than willing to deliver us from our own unhealthy God concepts—by reminding us what “all-attractive” really means. We just have to be open to the idea.